Poinsettias are ubiquitous with the holiday season. From our churches to our offices to our children’s schools, poinsettias are quite easy to come by during the month of December and oftentimes sold on behalf of charitable causes. Instead of just placing your poinsettias on a table indoors, use them to create a beautiful floral Christmas front door decoration. To create the hanging “vase” seen here, create a folder using sturdy red vinyl and a staple gun. 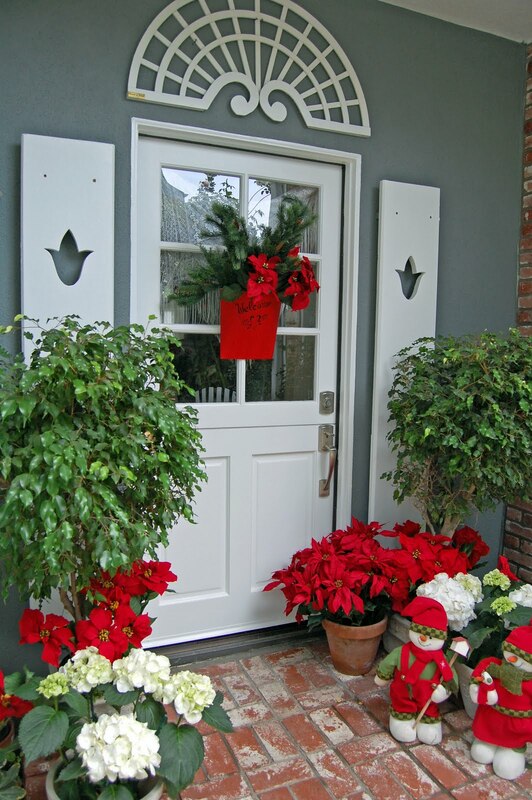 Fill with faux poinsettias so that you don’t have to worry about soil and water, then just hang it on your front door. The internet is full of Christmas ideas for unique and unexpected decorations. While those exciting decor ideas are great for many people, others just want something simple and classic. 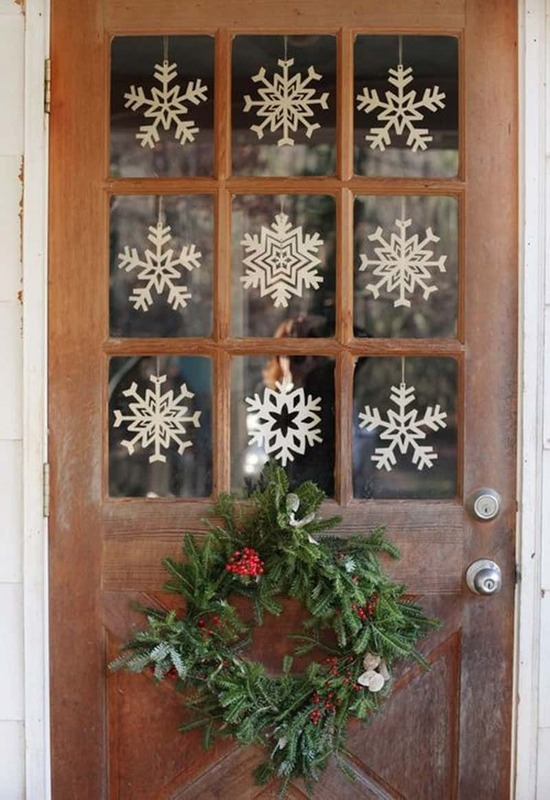 Placing a single handmade snowflake within each cell on the window of your front door is one of those Christmas door decorations that might not be flashy or trendy, but is perfect in its simplicity. To get the whole family involved, have each member of your household make one of the snowflakes by hand. This will give a touch of sentimental value to your beautiful holiday decor. 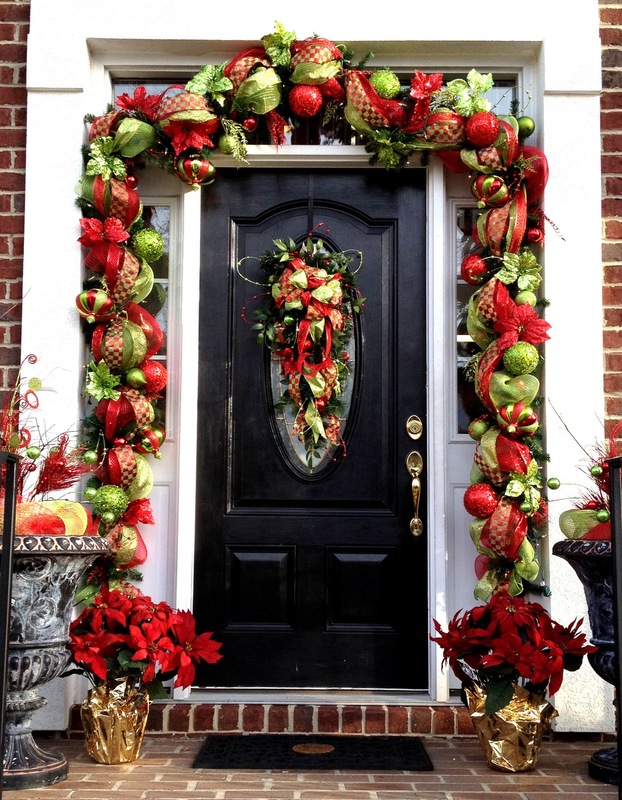 This beautiful display is one of the many Christmas front door decors that creates a beautiful overall finish by working with a myriad of textures and hues. Instead of just erecting a simple garland around the perimeter of their front door, this homeowner created something truly eye-catching and unique by adding oversize bells and globes, connected with large ribbons in an array of textures and hues. 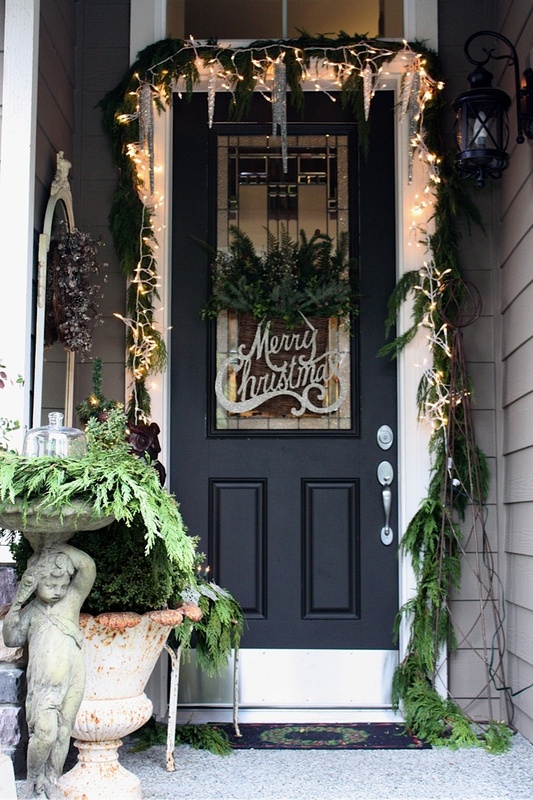 When it comes to your front door decorations, feel free to work with several different hues as well, as long as they are all in the same basic color family. 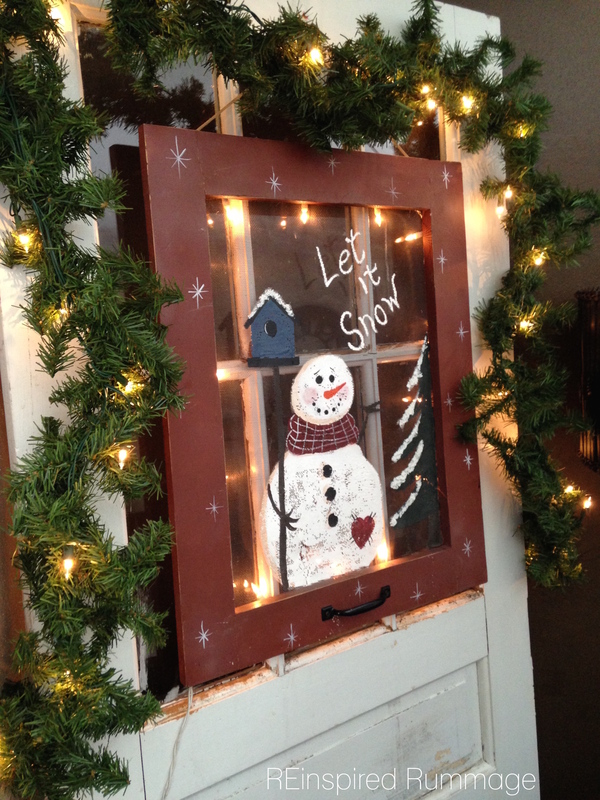 DIY Christmas front door decors are especially fun if you’re already somewhat of an artist to begin with. If you truly want a front door decoration that is absolutely unique and original, the only option is to paint it yourself. An inexpensive frame from the thrift store makes the perfect canvas for outdoor artwork. Paint the design of your choosing directly on the glass, spray-painting the frame whichever color you desire. Use a spray sealant over your finished design to ensure that it doesn’t run or chip if the weather outside becomes frightful. Gift tags are an iconic image that immediately evoke thoughts of waking up on Christmas morning to find a plethora of presents under the tree. A great way to spruce up Christmas wreaths is by creating an oversize gift tag with a simple message, such as “Merry Christmas.” Fasten it to the center of the wreath and hang on your front door for a cute but classic Christmas decoration. Some white string lights and a jolly red bow put the finishing touches on this adorable door decoration, as do the elf legs and Styrofoam candies also featured in this decor scheme. Christmas decor wouldn’t be Christmas decor without a few classic reindeer thrown into the mix. You can easily find these gold reindeer statues at high end home decor stores, but they can be somewhat pricey. 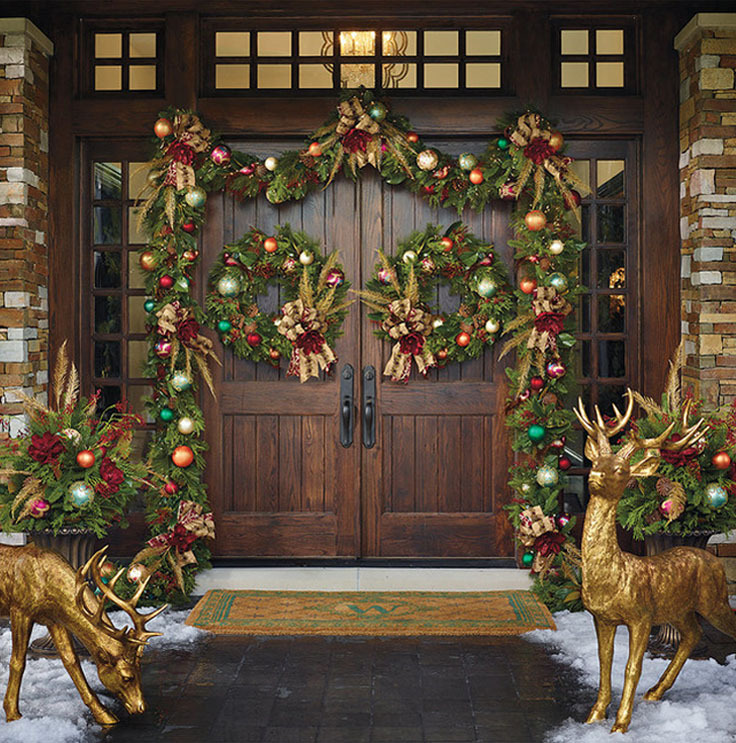 If you want to replicate this look for your own front door without spending a fortune, you can use gold spray paint with a shiny finish on inexpensive wooden reindeer, easily available at big box home improvement stores during the holidays. 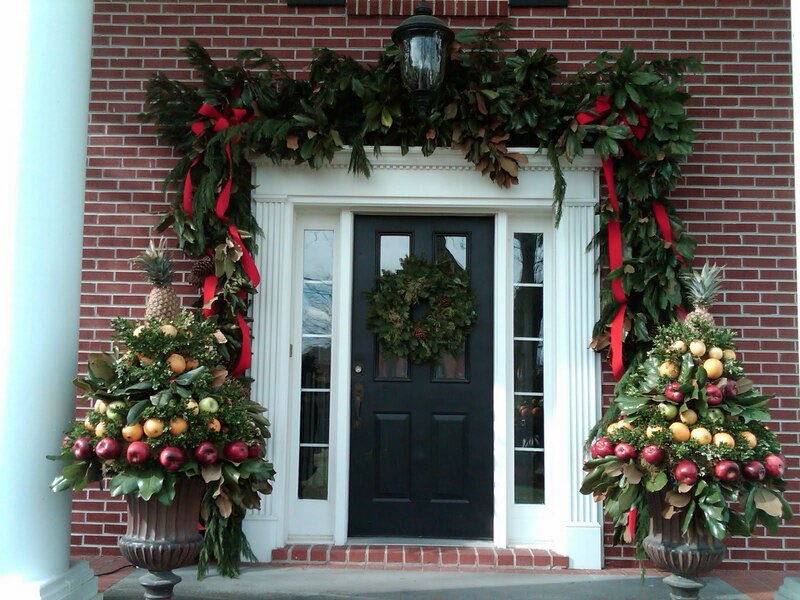 Decorate with garland and wreaths to finish off this beautiful, festive holiday landscape. Many homeowners find themselves at a loss when decorating particularly tall doorways. Websites and magazines devoted to Christmas door decorating ideas suggest to use garland, but strings of garland can look wimpy when strung around an oversize door. Solve this problem by taking a cue from the homeowner in the photograph and using multiple strands of garland to create one thick bundle. Extra large red ribbons and pine-cones stand out well on this large garland, which will look proportionate around your doorway. Be sure to use extra string lights on this garland so that it truly shines after the sun goes down. Not every Christmas decoration idea has to be over-the-top! This stunning front door display is one of the many simple decor schemes that is understated, but just festive enough for the holiday season. This homeowner ditched the traditional balsam and fir garland, instead going with a lightweight fern-type material. The greenery might not be classically “Christmas,” but the addition of twinkly lights and icicles hanging from atop gets the message across loud and clear. A simple “Merry Christmas” door hanger rounds off this simple yet joyous look, which is perfect for anyone who wants a front door look that will be quick to put up and quick to take apart. Many of the Christmas decoration ideas on this list feature the classic Christmas color scheme of red and green. 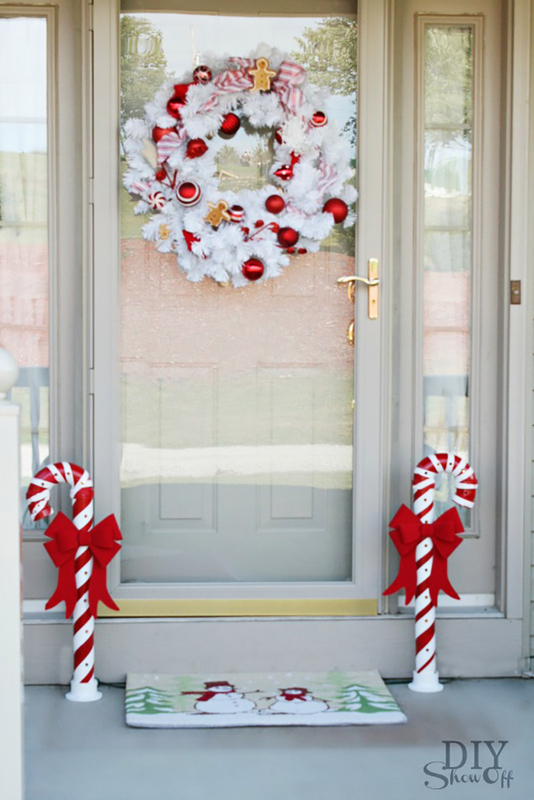 However, you don’t need fir sprigs and green to create a front door design that screams “it’s Christmastime.” The classic candy cane combo of red and white are just as festive. 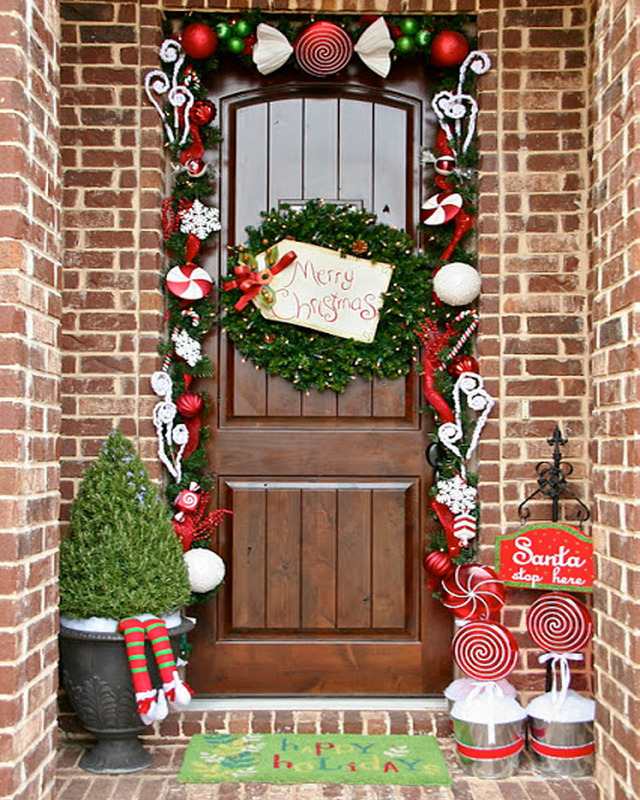 In addition to using two candy canes on either side of their door, this homeowner put together an adorable red and white wreath that features several miniature snowman ornaments. The red and white snowman welcome mat is the final little finishing touch that really ties their cheerful color scheme all together.